Spread The Light is organized and run by more than 20 “Harry Potter” fan sites and youtubers from around the world (for the full list, see below). The goal of this fundraiser is to help raise funds and awareness to the important work the Anne Rowling Clinic does. 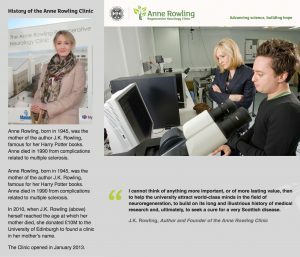 Founded in J.K. Rowling’s late mothers’ name, it provides out care for patients with multiple sclerosis and other Neurodegenerative diseases as well as cutting edge research and clinical trials. Despite MS, they treat conditions such as Parkinson’s, Huntington’s among other life-threatening conditions which currently have no cure. With your donation, that could change! Frequently asked questions and terms and conditions on the prize draw plus how you can enter for free can be found here. Donate now until July 31st! The following fan sites organized Spread The Light: Always J.K. Rowling, Potterish, Univers Harry Potter, Animagos, Accio News, Hogwartsite, Potterveille, Animais Fantásticos Brasil, The Rowling Vault, O Profeta Diário, Harry Latino, Portkey, Gazette Du Sorcier, The HP Fan, HPANA, Wizards and What Not, Giratempo Web and Observatório Potter.